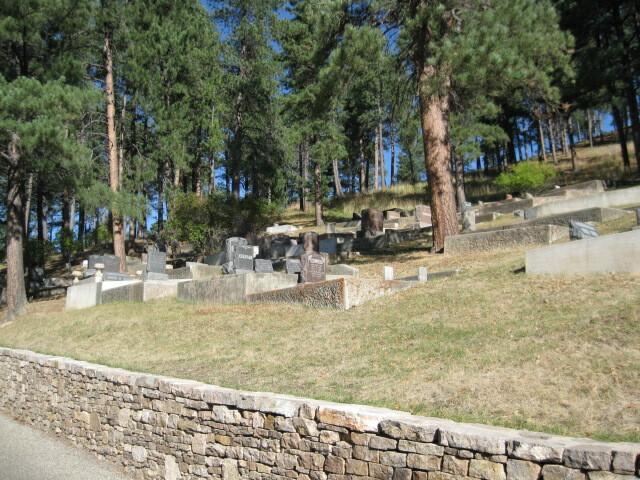 Many early residents of Deadwood were buried at Mt. Moriah or at its predecessor, the Ingleside Cemetery, down the hill to the left of the present cemetery. Mt. Moriah Cemetery was established in 1877-1878 because of the ever-increasing demands on the old cemetery at Ingleside, now a residential section of Deadwood. Many of those buried at Ingleside were exhumed and located to the new cemetery, however remains from the old cemetery are periodically unearthed when residents dig around their homes. Mt. Moriah has numerous sections. At one time a large number of Chinese were buried in the upper left section. For religious reasons, the bodies were later exhumed and returned to China for re-burial. Today only a few graves exist in this section. The Jewish section is also located in the upper section of the cemetery. Many of the prominent citizens who founded Mt. Moriah Cemetery were Masons, and one of the most attractive is the Masonic section located in the center of the cemetery. Many of the roads in the cemetery have names connected with Masonry. Children’s graves are found throughout the cemetery and there are three Potters’ Fields, final resting places for early day indigents and prostitutes. Most of these graves are unmarked. There is also a Civil War and Indian War veterans section. Willis H. Bonham (1847-1927) editor and publisher of the Deadwood-Pioneer Times newspaper for nearly 50 years.